Ferrari 360 is a two-seater sports car that was manufactured by Ferrari from the year 1999 till 2005. This mid-sized mid-engine car replaced the then Ferrari F355. An brand new all-aluminum frame chassis was built for the Ferrari 360 after it united with Alcoa (Aluminum Company of America). This gave a new look increasing the rigidity by 40% and decreasing the body weight by 28%. The engine that was used in Ferrari 360 is the new V8 engine which was much more powerful than that used for the previous Ferrari F355. The added stiffness to Ferrari 360 improved the performance where the acceleration from 0 to 100 mph was improved from 4.6 to almost 4.4 seconds. The technology used in this engine was soon followed by the other cars that were released later. 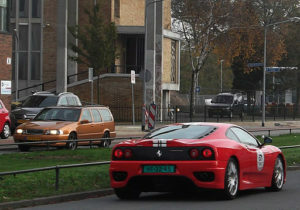 F430 used the similar V8 engine that was produced later replacing the Ferrari 360. Based on the design of Ferrari 360, few other models were released that were the different versions of this car model. 360 Modena is one of the first models that were released at par with Ferrari 360. It is a luxury sports-coupe that consisted of a two door coupe and came along with 6-speed manual transmission. Later, a convertible alternative if the Modena was released which was called the 360 Spider. Challenge Stradale is another road model of Ferrari 360 that was released inspired by the design and technology of the 360 Modena and Spider. These three car models mentioned here were the three road models that were released of Ferrari 360.Few of the factory race car models were also released based on technology used in Ferrari 360. 360 Challenge, 360 GT and 360 GT-C were three factory model cars of the 360. Almost all of the road models contained similar specifications and layout. For example, the same V8 engine was used with the same number of cylinders in all the models. The power and torque produced remained the same in Modena and Spider but slightly varied when it came to the Challenge Stradale. The top speed of the 360 Modena reached around 183 mph and the acceleration took about 3.9 seconds from 0 to 60 mph. The Spider though was considered as the classic sports car even when it was launched in the year 2000. Heavy design engineering was performed to get the stiffness and the performance for the Spider model. The looks of this model were also well received by the users. People say that 360 Spider looks very aggressive with its hood up but totally transforms into a neat and simple look when the hood is lowered. The design engineers took care and precision while working with its hood as it automatically folds away inside the engine bay despite the mid-mounted V8 engine that is being used by this car. The Challenge Stradale was more inspired by the racing car style and was slightly different from the Modena or the Spider model. It was purely made only for the track days. Though the technology and design remained much similar, there are very few subtle changes between the three road models of Ferrari 360. More Ferrari 360 information and Ferrari 360 pictures. Part of the reason Classic Cars Online US exists is to help connect classic car buyers and sellers, and we’ve added several ways for you to connect, but first, be sure to visit the Classifieds page if you’re in the market to buy or sell classic cars such as the iconic Ferrari 360.